The rest of your networking gear to serve your normal network. First, we need to set up the router to just route. I have three interfaces in mine – eth1, eth2 and eth3. eth1 will be my internal network, eth2 will be the public network, and eth3 will be for the WAP. Notice how eth1 and eth3 are on different subnets – this is important, make sure whatever internal addresses you use that they use different subnets. This is your external interface, this will tell it to nat everything properly. Unless you want to set the default policy to DROP, then you will be done. If you do want to set it to drop, you need to allow your internal networks. Now that it’s configured to route traffic through it, we need to set up a DHCP server on the router, I will be using dhcp3-server, you are welcome to use whatever you want – but this guide walks you through the configuration of this server. # People who live here. I have included my entire config, in the event you want to set up machines that are statically assigned. The important parts are the options present in the KITTIES section. Go ahead and set up both subnets now, since we’d just come back and edit this file later anyway. Now that your server is serving dhcp leases, make sure you set everything to come up on boot. Next we set up the proxy, install squid and apache2 from your friendly repository and edit /etc/squid3/squid.conf. In DDWRT on the WAP you’ll need to configure it to be a DHCP forwarded, pointing at 10.1.2.1, set its static ip to something like 10.1.2.6, and set it to just be a router and have no NAT, etc. This should be fairly straight forward to do, if you need help just glance through the DDWRT wiki. Now that we have the WAP configured, we want to lock it down some. The initial three rules prohibit anything to access the 10.1.1.1 IP from 10.1.2.0/24(It’s not considered “forwarded” because it never leaves the box), to allow access to the WAP so you can manage it(You’ll obviously need to replace the mac with the mac of your specific WAP, I accomplished this by doing a ping from the router to the WAP, and then used tcpdump -e -i eth3 icmp to get it. ), and not to allow any access to your other subnet. Then we have some ACCEPT statements for port 80(HTTP), 53(DNS) and ICMP (You could technically lock this down further and only allow ping, but just ICMP should be fine). The final rule is a reject so that they are not able to access any port externally – this should prohibit abusing your network for things like bit torrent in most cases, however there is still the threat of them just downloading tons of things via HTTP. Unfortunately, there isn’t really a quick and easy button to do this – you can experiment with tc, or try utilizing transmission limits on your DD-WRT device. This is something you’ll just need to play around with! 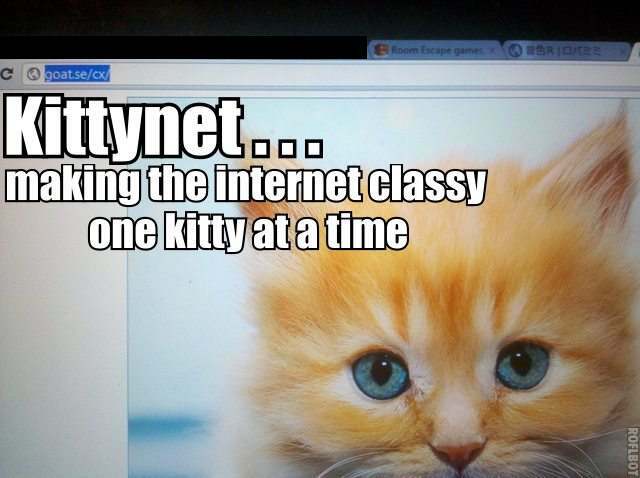 Make sure all your settings are saved, and then go ahead and unsecure your wireless to let your neighbors experience the Kittynet.